So..I thought it about time I joined in with #ToxicCarnival since I spent 3.5 years of my life playing with oh so scary elemental fluorine for my PhD. According to gospel Wikipedia “above a concentration of 25 ppm, fluorine causes significant irritation while attacking the eyes, respiratory tract, lungs, liver and kidneys. At a concentration of 100 ppm, human eyes and noses are seriously damaged”. The MSDS of fluorine also states that fluorine gas is corrosive to exposed tissues and to the upper and lower respiratory tracts. Fluorine penetrates deeply into body tissues and will continue to exert toxic effects unless neutralized. Workers should have 2.5% calcium gluconate gel on hand before work with fluorine begins. Fluorine also reacts violently and decomposes to hydrofluoric acid (which has previously been described as part of #ToxicCarnival) on contact with moisture. Fluorine is the most powerful oxidiser known. It reacts with virtually all inorganic and organic substances. Fluorine ignites in contact with ammonia, ceramic materials, phosphorus, sulfur, copper wire, acetone and many other organic and inorganic compounds. As you can tell, it is pretty darn unpleasant. Thankfully, the very pungent odour is detectable at concentrations as low as 20 ppb so you have time to escape, should you come across a fluorine leak. A little history lesson… Fluorine was isolated successfully over a century ago by Moissan (Ann. 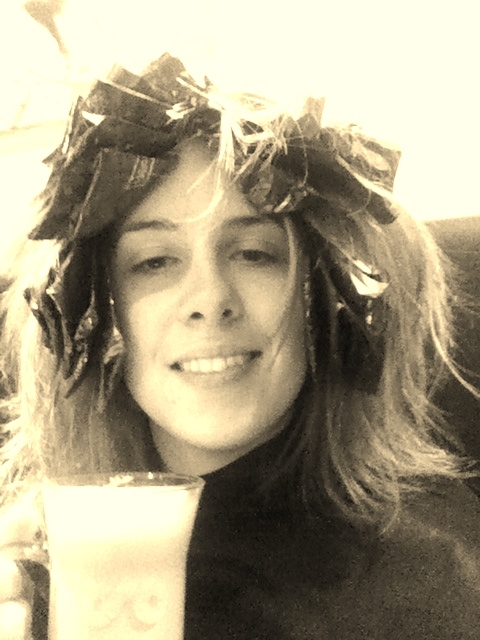 Chim. Phys., 1891, 19, 272.) who gained a Nobel Prize in 1906 for his achievement. He produced fluorine by electrolysing a solution of potassium hydrogen difluoride in non-conducting liquid anhydrous HF. The electrolytic cell was constructed from platinum/iridium electrodes in a platinum holder and the apparatus was cooled to -50 °C. Today, fluorine is still manufactured using this electrochemical process. The first large-scale production of fluorine was actually associated with the Manhattan Project during World War II, where uranium hexafluoride (UF6) was used to allow separation of the 235U and 238U isotopes. The radioactive uranium was used for the construction of the first atomic bombs in 1945 and uranium refining for nuclear energy is still one of the major uses for elemental fluorine. So..so far you have learnt that fluorine is scary stuff and can be used to make atomic bombs. Now I am going to tell you why we should all love fluorine a little more. Organo-fluorine compounds are almost non-existent as natural products but these days 20–25 % of pharmaceuticals contain at least one fluorine atom with these drugs treating a huge variety of diseases. 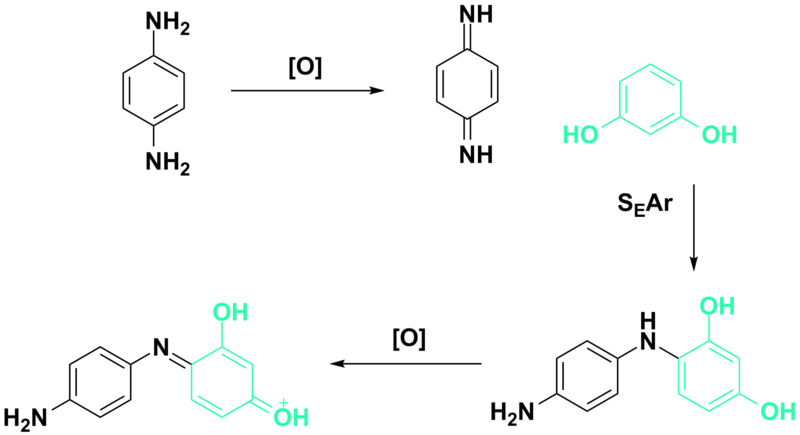 One of the earliest synthetic fluorinated drugs was the anti-neoplastic agent 5-fluorouracil, an anti-metabolite first synthesised in 1957 (Nature, 1957, 179, 663-666). It shows high anticancer activity by inhibiting the enzyme thymidylate synthase, thereby preventing the cellular synthesis of thymidine. Since 5-fluorouracil, fluorine substitution is commonly used in med. chem. to improve metabolic stability, bioavailability and protein–ligand interactions amongst other things. An increasing number of related fluorinated anti-tumour agents have now becoming available as cancer treatments, including 5-fluoro-2’- deoxyuridine and its derivatives (Frontiers Biosci., 2004, 9, 2484-2494).  5-Fluorouracil is synthesised by bubbling fluorine through a solution of uracil in a high di-electric constant solvent. If used correctly and safely fluorine can be a cheap and easy reagent, especially in large scale synthesis. EASY PEASY! 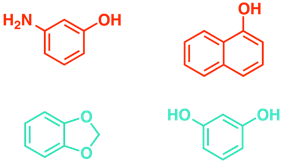 Other fluorinating agents (mainly N-F) are seen to be an easier and safer alternative but these reagents can be expensive and wasteful. Using elemental fluorine is really all about knowing how to use it, for example it is best when the reaction is carried out at around -10C as a low concentration mixture in nitrogen. The key is to stop the competing radical reaction and promote the electrophilic process by polarising the F-F bond. 3) I love fluorine a little too much. If you want to know more about elemental fluorine in synthesis then check out publications by R. D. Chambers, G. Sandford and S. Rozen. All legends in their own right. If you want to know more about fluorine, then just get in touch. I may or may not know the answer but I will probably be able to point you in the right direction. Contact lenses… more interesting than meets the eye? So anyone who follows me on twitter might know that I have had some eye issues in the past. I have had blocked eye lid glands which were exacerbated by my repeated wearing of contact lenses and this got me to thinking…what the heck are my contact lenses made from and why were they making my eyes dry? In 1936, polymethylmethacrylate (PMMA) was introduced and this led to the first commercial example of contact lenses. A big improvement in the industry came in the 1970s when Wichterle1 introduced the soft hydrogel, polymacon or polyHEMA (poly-2-hydroxyethyl methacrylate). 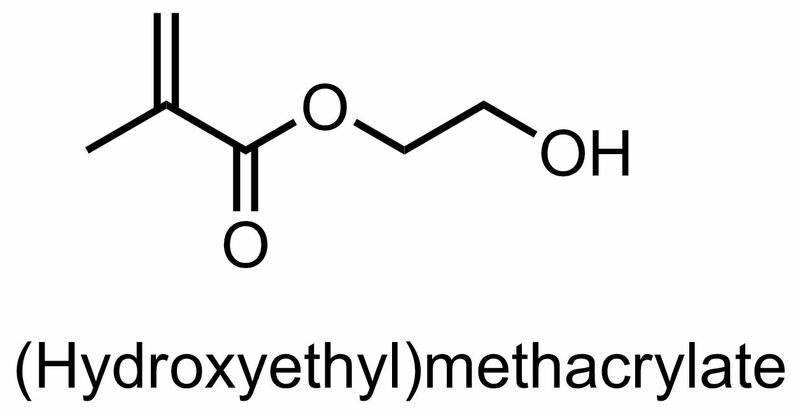 HEMA is synthesised from methacrylic acid and ethylene or propylene oxide and then polymerised to give polyHEMA. Soft contact lenses worn by most people now are still made from hydrogels. A hydrogel is a network of hydrophilic polymer chains that is insoluble in water. The main advantage of hydrogels is that they are very highly absorbent and may absorb up to thousands of times their dry weight in water. To be a hydrogel, water must constitute at least 10% of the total weight (or volume) of the polymer. When the content of water exceeds 95% of the total weight (or volume), the hydrogel is said to be super-absorbent. Have you ever noticed that when you leave your contact lens out of the solution it shrivels up and hardens but when you put it back in solution it becomes soft and flexible again? This is because it is a hydrogel. Contact lenses are required to do a lot: maintain a tear film for clear vision, sustain normal hydration, allow oxygen to permeate and be non-irritating and comfortable. The lens must have excellent surface characteristics being neither hydrophobic nor lipophilic (and there are many publications on the surface properties of contact lenses should you want to find out more). It is pretty amazing that they do all this work whilst allowing us to see properly. Interestingly, the reason we are supposed to only wear our contact lenses for only ~12 hours a day is because keeping them in too long can cause continuous corneal hypoxia. 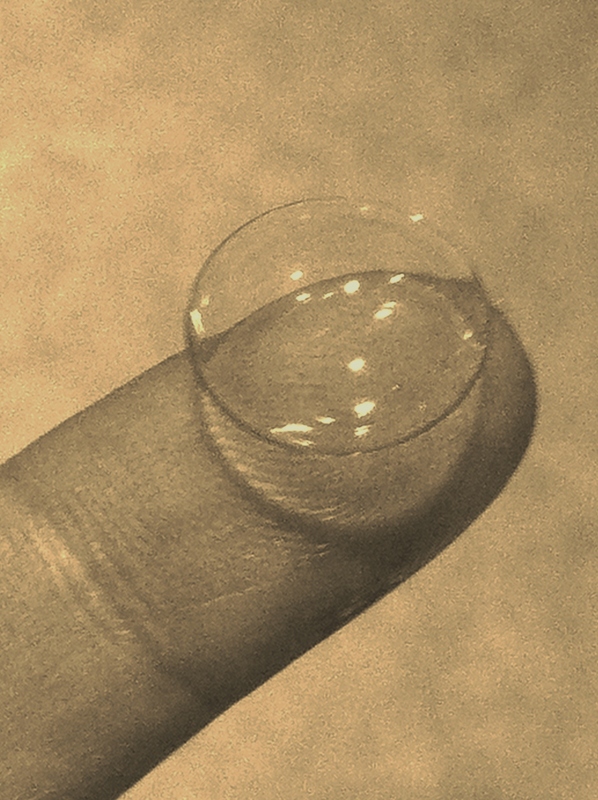 Hydrogel-based contact lenses are thought to reduce this as oxygen can diffuse through the lens. 5 Contact lenses can be a made from a range of polymer hydrogels, many of which now contain silicone as these are thought to allow more oxygen to the eye and therefore lead to healthier eyes. As the name suggests, hydrogels form sticky gel like materials which can be used in a wide variety of applications from drug delivery to tissue engineering. There are some great reviews on hydrogels in biology and medicine by Pappas and Langer4 and Hoffman3 and I highly recommend reading more because hydrogels really are interesting things! I haven’t gone into the polymer chemistry involved in the synthesis of hydrogels but I hope you have learnt something about the gooey things we put in our eyes on a daily basis. 1 O. Wichterle, D. Lim, Nature, 1960, 185, 117-118. 2 P. C. Nicolson, J. Vogt, Biomaterials, 2001, 22, 3273-3283. 4 N. Peppas, J. Z. Hilt, A. Khademhosseini, R. Langer, J. Adv. Mater., 2006, 18, 1345.